Each xform has zero or more variations contained in it that get applied during each iteration. The value to the right of the variation name is its weight. The sub-items below it are variables for parametric variations. You can right click in the numeric fields to get a menu of useful constants. Note that if you have Right Click Toggles Spinboxes checked in the Options dialog, then you must hold down shift for this menu to appear. 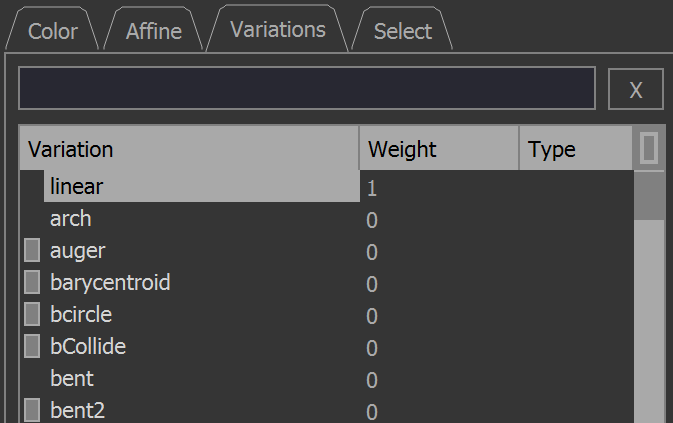 Add a variation to the currently selected xforms by scrolling its weight to a non-zero value. Remove it by scrolling its weight back to zero. If a parametric variable is changed, but its containing variation is not present in the xform, nothing happens. The change will only apply to selected xforms which contain that variation. A quick way to add or remove a variation is to double click the weight spinner, which will toggle the weight between 0 and 1. Adding or removing variations will trigger an OpenCL recompile, so there will be a slight pause when using the GPU. For most variations, the order in which they are added makes no difference since their outputs are summed. However, there are a few which assign their outputs rather than sum them. These will have a red square present in the Type column. This means order matters for those variations, and Fractorium does not support manually setting variation application order. For such variations, you can tell how the order matters because when you remove them, then add them back, the output image looks different as a result. All variations with non-zero weights (included in the xform) will be shaded gray to make them easily identifiable. The background color for this can be changed in the dark theme. Red: Uses non-standard assignment which means direct assignment for regular variations, and sum for pre/post (the standard is the reverse: sum for regular and assign for pre/post). Blue: Uses an internal variation state. This is mostly just of engineering interest. Typing in this box does a case insensitive search which will only show variations with matching text. To restore all, click the X button to the right. Clicking on the left header column will sort by variation name. 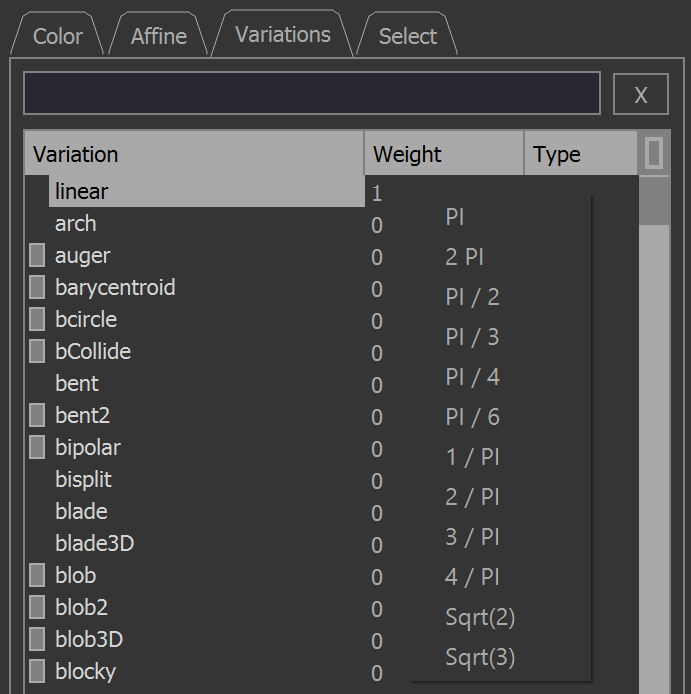 Clicking on the right header column will sort by weight, placing all variations in the current xform with non-zero weights at the top.